Belmont University College of Pharmacy third-year students Dominic Paolella, David Luong, Abdul Mohammed, Jonathan Ashton and Aziz Afzali recently undertook the challenge of developing a new and exciting telepharmacy access point for patients on the mend, understanding the importance of patients recovering in their own homes. In recent years, a growing body of scientific evidence suggests that patient recovery is more successful when they transition from dedicated healthcare facilities like hospitals, nursing homes and assisted living facilities into their own homes. But many patients require help to facilitate the change. Amazon Alexa is a new artificially intelligent platform for accessing information and interacting with objects in the home including lights, music and medical devices. 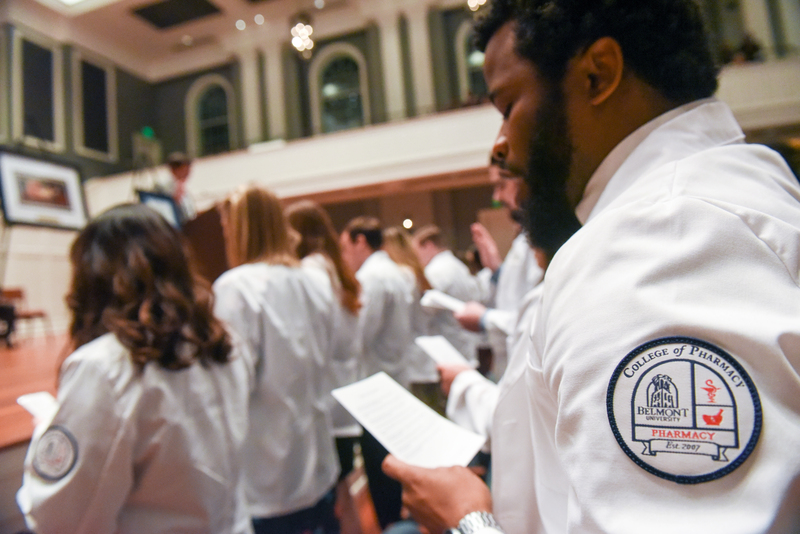 As part of the Introduction to Healthcare Informatics III and Advanced Pharmacy Practice Experiential (APPE) classes in the Doctor of Pharmacy curriculum at Belmont University, each student developed a voice activated application, or “skill,” for the Alexa platform. The skills can be downloaded and activated on demand, answering drug information questions with accurate medical information. Alexa’s artificial intelligence allows counseling to be taken out of the pharmacy and into the patient’s living room. This is especially beneficial when a home care nurse is not available. “In these cases, it would be convenient to have a small, inexpensive device at home which could be a conduit for patients to access answers to their healthcare questions at home and on-demand,” said Ashton. Belmont’s sponsor of the Amazon Alexa Developer Initiative is Assistant Professor of Healthcare Informatics and Analytics Dr. Anthony Blash. To prepare student pharmacists in the healthcare informatics concentration to become future leaders in healthcare informatics, Blash has created a four-course sequence and one month intensive experiential rotations. “Through our partnership with Amazon, we are exploring new ways to provide telepharmacy services in innovative and inexpensive ways to large segments of the population,” Blash said. DrugInfo3 allows the user to ask about generic names of antibiotics to gather pertinent information for more than 35 antibiotics including ciprofloxacin, erythromycin and isoniazid. Asthma Device Helper provides step-by-step patient counseling on proper use of many common asthma inhalers. “For me, the project was a proof of concept. While our project was limited to drug information, the technology could be applied to many aspects of care. There are lots of possibilities for future development with this artificial intelligence platform, and a lot of opportunities to help our patients in new and exciting ways.” said Mohammed. While none of these skills should replace a consultation with licensed healthcare professionals, the free skills can be accessed via the Amazon Skills store or through the Alexa app, available for Amazon Fire, Apple and Android devices. To download these skills onto Alexa, choose “Skills” from the Alexa app menu and search for the skill by name.